The Calgary Airport Authority unveiled its new strategic direction and guiding vision statement, aptly referred to as the North Star. The Authority’s new direction will focus on elevating guest experiences with the goal of driving economic growth and prosperity for Calgary and Alberta. To embody this new direction, a refreshed visual identity for YYC Calgary International Airport was also unveiled. “We create effortless and memorable airport experiences that reflect Calgary’s legendary hospitality and our region’s natural beauty.” is the new North Star vision statement. Inspired by the things that make Calgary and southern Alberta unique, The Calgary Airport Authority is creating a plan for the airport that truly reflects the city and region, and encouraging visitors to return. 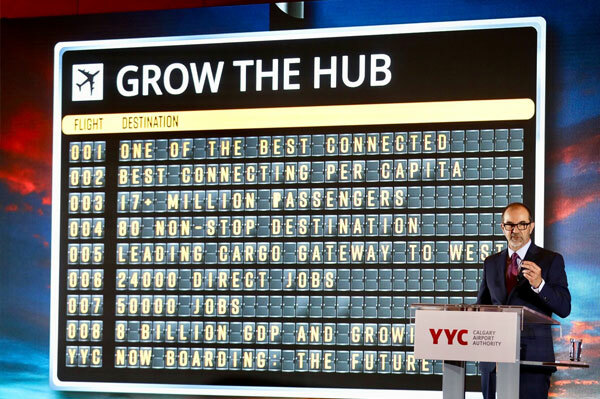 A new approach to retail and service offerings at YYC; improvements to processes within the airport; enhancements to the domestic terminal; and leveraging the entire campus development plan with the appropriate mix of businesses will all be factored into fueling Calgary’s economic prosperity. Seen in the photo is the Calgary Airport Authority’s president and CEO, Bob Sartor.